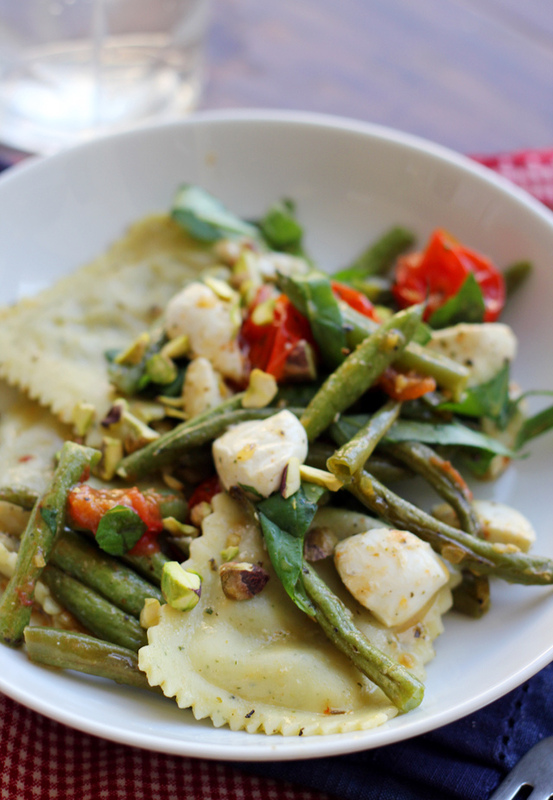 Not all pasta salads have to be mayo-drenched! 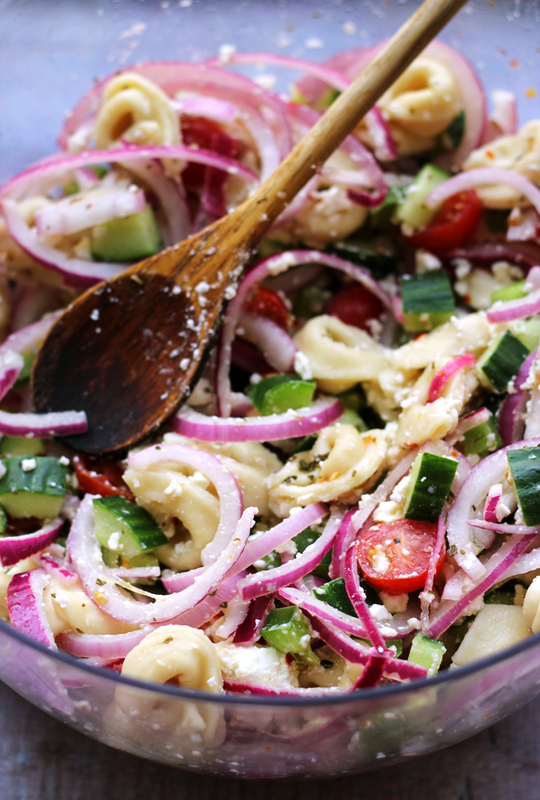 This Mediterranean tortellini salad with red wine vinaigrette is full of fresh veggies and bright flavors…perfect after spending a day in the sun. This is my attempt to try not being the girl who brings the food with weird ingredients to every family gathering. It was a struggle. I wanted to go to crazytown with all sorts of olives and sun-dried vegetables and funky cheeses that technically are of Mediterranean descent. But exercising restraint at the Whole Foods cheese counter is “good for you”. Or so I’ve heard. Plus the.boy hates olives with the kind of fiery passion that is matched only by my disdain of celery, and it’s only fair that, since he respects my celery ban, I don’t insist on putting olives in every meal I make. So instead of breaking out some ancient grains or scouring the local farmer’s markets for the most esoteric vegetable I could get my hands on, for a recent bbq at the.boy’s parents’ house I tried to stick to ingredients that pretty much everyone should be able to pronounce and a flavor profile that even the pickiest of Greek/Italian eaters would be familiar with. And then I measured my success in the very large empty bowl that came home with me and cried some crocodile tears over the fact that I would have no leftovers for the week ahead. I guess you could say people liked it? 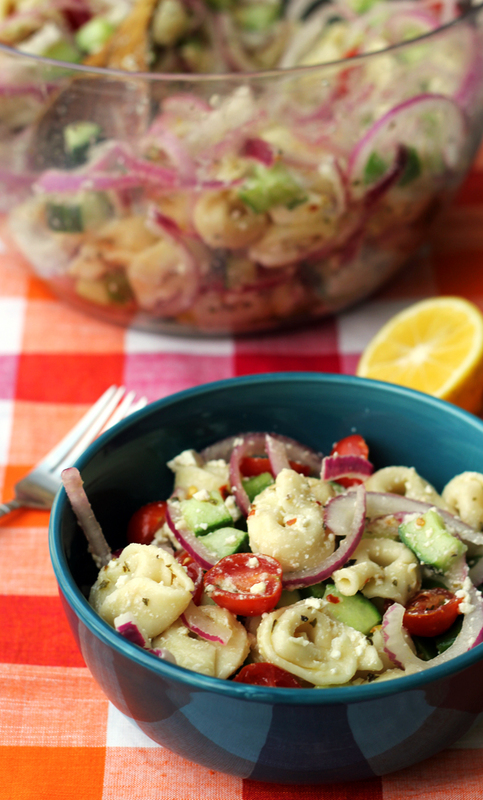 I’m not really sure what there is not to like when you pair the fresh flavors of summer’s bounty in the form of cherry tomatoes, cucumbers, and bell peppers with cheese tortellini and tie it all together with a tangy, but not overpowering vinaigrette and a sprinkling of feta cheese. It’s perfect for any summer gathering that pairs the more adventurous eaters who gag at the thought of wasting their stomach space on a typical deli macaroni salad (aka moi) with more conservative palates who just want to eat what they know and know what they eat. Might I suggest this holiday weekend as the perfect venue for trying it out? And we’ll just save our secret stashes of hemp seeds and garlic scapes for next time. We do have a reputation to maintain, after all. Not all pasta salads have to be mayo-drenched! This Mediterranean tortellini salad with red wine vinaigrette is full of fresh veggies and bright flavors...perfect after spending a day in the sun. Bring a pot of salted water to a boil and cook the tortellini according to package instructions. Meanwhile, place the onions in a bowl of cold water to get rid of some of the bite. Drain after 5 minutes. 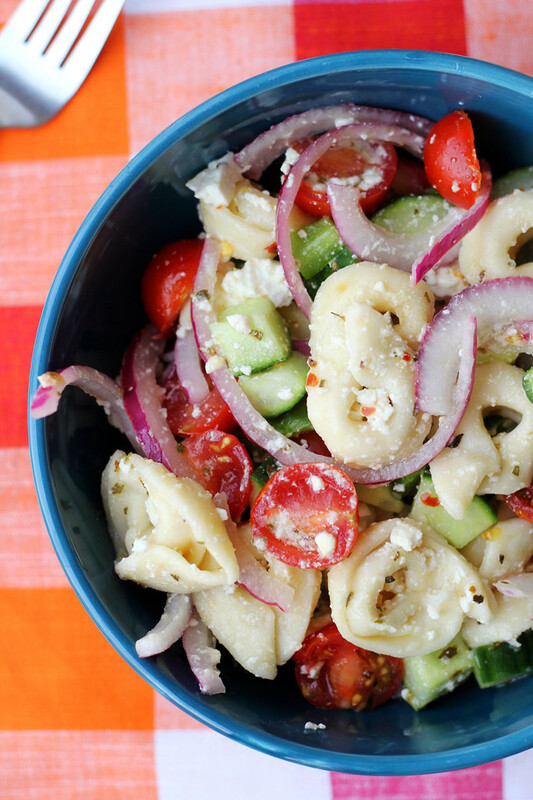 When the tortellini is done cooking, toss together the onion slices, cherry tomatoes, cucumber, bell pepper, feta cheese, and tortellini. 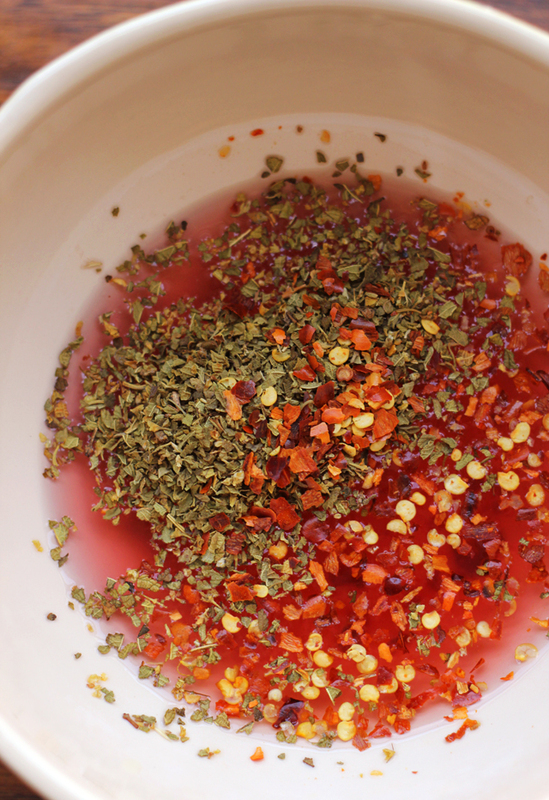 In a separate bowl, whisk together the red wine vinegar, lemon juice, sugar, oregano, and red pepper flakes. Slowly pour in the olive oil and whisk to combine. Season to taste with salt and black pepper. Pour the dressing over the tortellini salad and toss to combine. Serve warm or at room temperature. Happy 4th of July! This looks like perfect party food – tasty and flavourful but hearty enough to power you through. I have NEVER made tortellini salad. This needs to change! Oh my, what’s not to like in this beautiful salad. Happy, but not surprised, it was a huge success. It IS hard to control oneself at Whole Foods, they have such a great cheese counter and the olive bar is to die for. Bet your Whole Foods is huge compared to the one we have in Tallahassee! I’m with you o the mayo-drenched pasta salads. This is a wonderful alternative! I am super picky about pasta salads, but this I like! I am always game for new dressings cuz I am rubbish at them. Love this one! Happy 4th of July Joanne….another great recipe. I love the dressing for this! 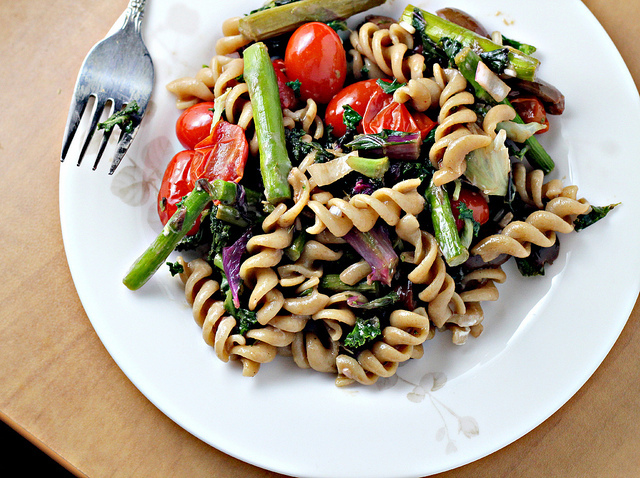 Love this pasta salad and especially the dressing. I think it’s great that you are always trying something new, always something to look forward to. I never put mayo on pasta salad – nor anything else for that matter. 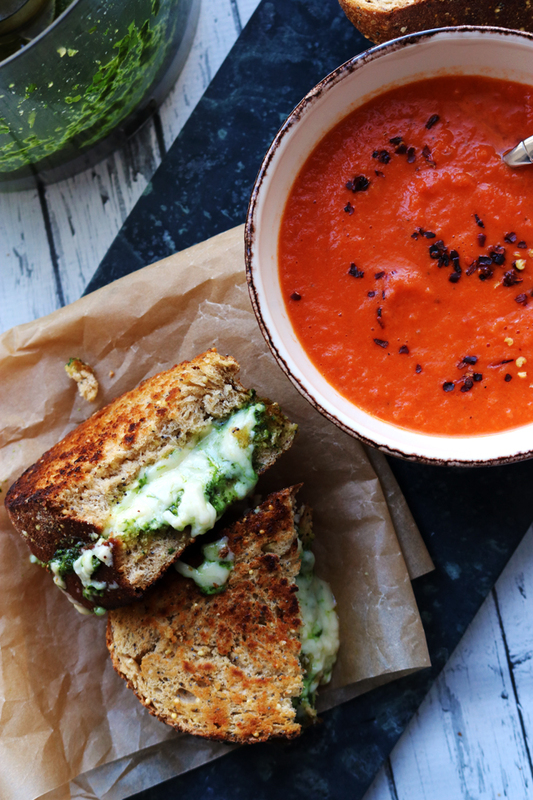 This is a nice combo – love the onions and specs of cheese. I always have to try to bring universally appreciated foods to potlucks–if I don’t check up on myself, I would make a big kale salad with quinoa and tahini and it would scare everyone off just by the sheer concentration of greenery in one bowl. This looks like the perfect compromise! I have never made a tortellini salad, let alone had one…it looks fresh and delicious..definitely a must have on my dinner table. I am not at all surprised you came home with an empty bowl. That looks wonderful! Happy 4th! This sounds amazing. I agree not all salads have to be mayonnaise based. I love the dressing that you put on this salad. 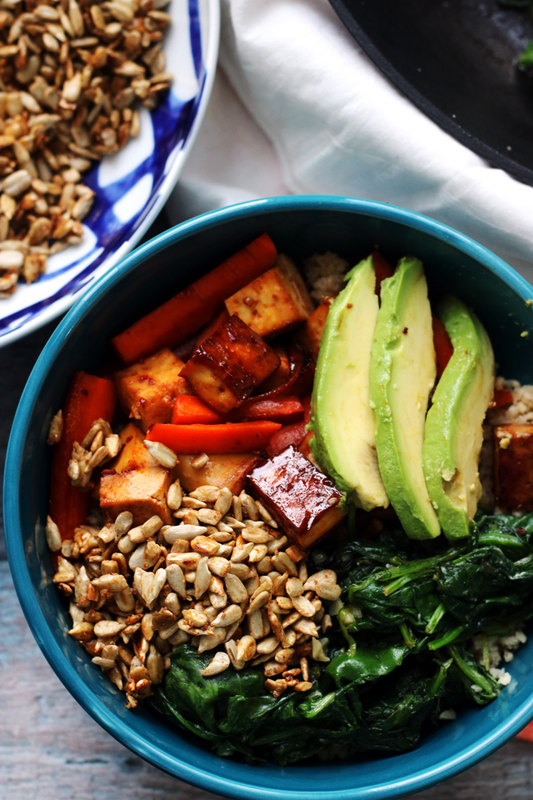 I could eat that entire bowl myself. My kind of flavors going on in here. Anything Mediterranean or Greek and I’m there! looks heavenly! Tortellini in a pastas salad? That’s brilliant. Totally gorgeous salad, Joanne! 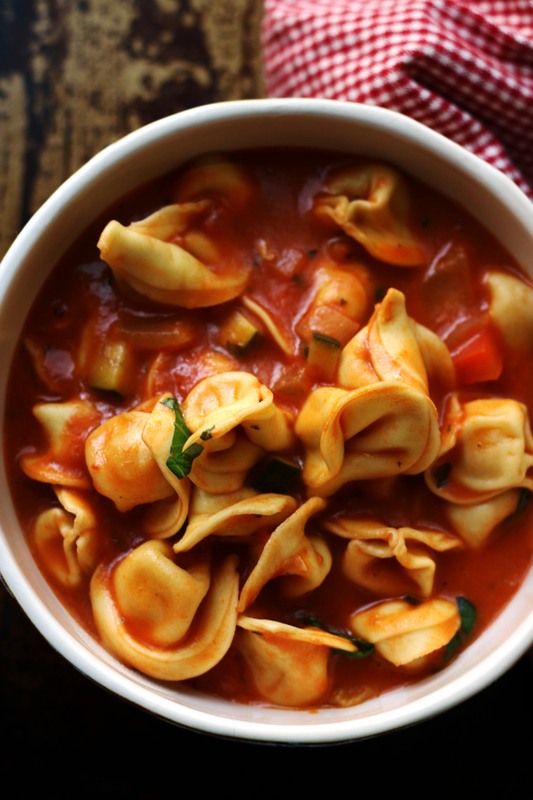 I can’t get enough of Mediterranean-style food and love how you threw tortellini into the mix! 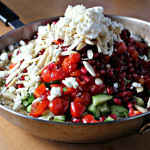 Can’t wait to try this salad for one of our cook-outs! Mmm of course people liked it – this looks delicious!! 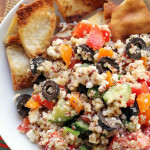 I love pasta salad, and mediterranean flavors are my absolute favorite!! Gorgeous! Hope you are having a great holiday weekend! 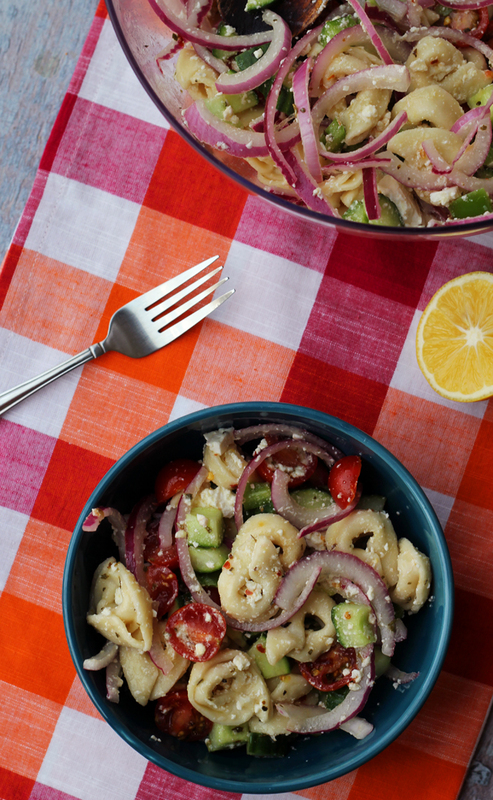 I made a very similar greek pasta salad a couple of weeks ago to take to the beach for an impromptu picnic – I love that you used red pepper flakes in your dressing – why didn’t I think of that – I love that stuff! Great looking salad! I’m a big fan of non-mayo based pasta salads. OMG this looks amazing I could face plant into this right about now! Another good one Joanne! Love these kind of pasta salads! So good, the Mediterranean flavours are some of my favourite! I think I am in love with this pasta salad. Literally – I softly gasped when I saw it. This is being made IMMEDIATELY! Hope you guys had a nice Fourth!! I love a non mayo drenched salad and the flavors are fabulous. Have a great weekend! 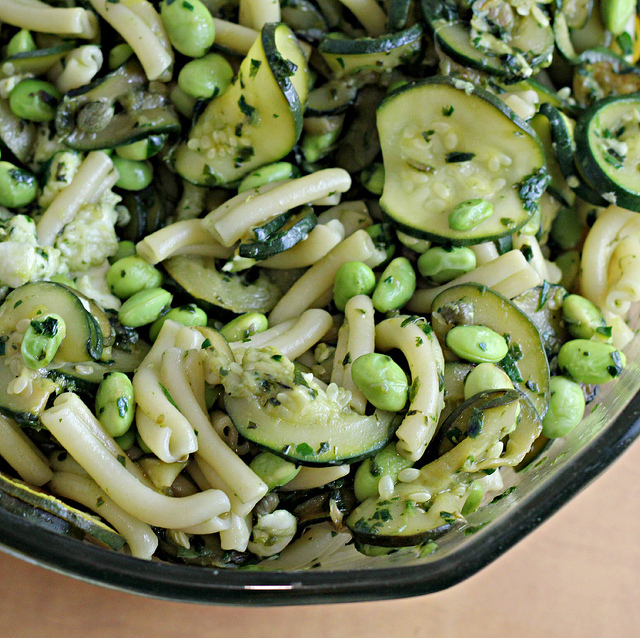 This is the perfect summer pasta salad! Can we please have a crazy-town version too? 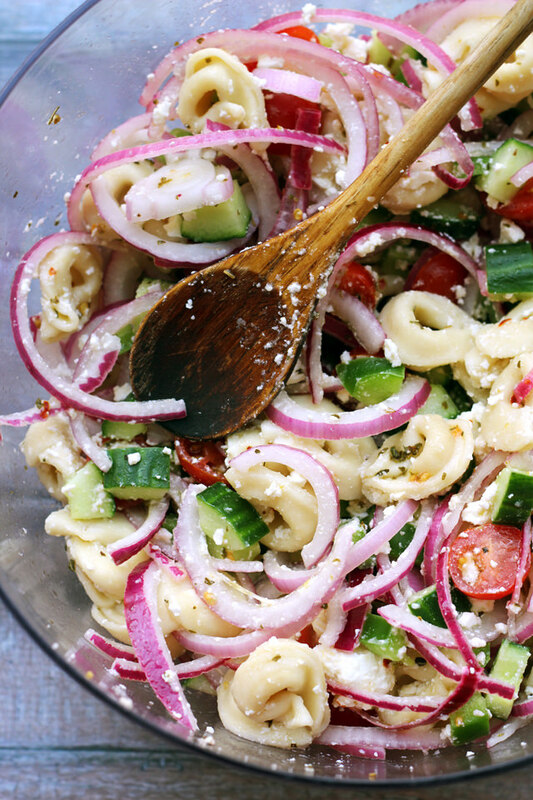 Your salad looks so much better than the usual mayo drenched pasta salads. Everybody in my family would like this version: the fitness conscious because it’s light and healthy and everybody else as well because it looks delicious! Your salads are always beautifully crafted and amazing!!! Lovely colors and everything nice!! Yum! As a mayo hater (AND an olive hater!) this salad is totally up my alley. Take that, summer picnics, I’m ready for you! I only do mayo-less pasta salads! Yum yum! I totally agree with the non-mayo-ness (new word?) of this pasta, because I prefer lighter pastas. Can I just drink that dressing?? I prefer my pasta salads with a vinaigrette over a mayo! Love your restraint! J’adore! Your salad is beautiful and looks absolutely delicious! 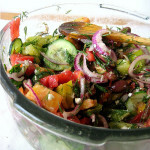 What a super salad – great flavors and textures – perfect summer food! This is a great idea for a family gathering! 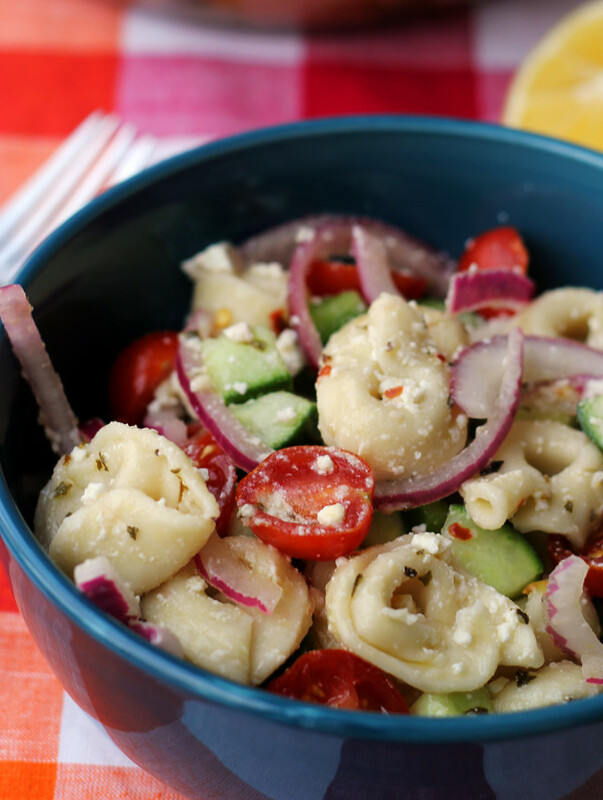 Pasta salad is always a hit and I’ve never even thought to use tortellini in a pasta salad, I’m sure it makes it ten times better! Paul doesn’t like olives, either. Or artichokes. They’re pretty much the only two foods that he sort of puts his foot down to. And honestly, he’d still eat them if I asked him nicely. So I can’t complain too much. But I do. Because…olives. I love them. And artichokes. I mean, come on! Love. What a great idea for a salad, Joanne. Like a Greek salad but just a bit different. I can imagine this would go reeeaaallly fast at a pot-luck BBQ. This looks fantastic! Though I’m a fan of mayo, you’re right: not everything needs to be slathered in it, especially in summer. (Mayo sitting outside too long = yuck.) I just found out I’m hosting a get-together this weekend, and this might find its way onto the menu . . . I haven’t a clue why lately I’m craving onions. I heard it was a mineral deficiency? Not sure about that. BUT I love how many red onions you added in here. umm I think I need to make this, except I WILL go crazytown on ingredient additions, even if I’m the only one that eats it! Joann, this is our kind of salad. We grew up with salads like this one. Never-ever did our mom ever use mayo in a salad. She was old school Italian! I’m always doing the “what can I bring to family gatherings and what do I have to eat myself” game regarding blog food leftovers. The family is not particularly adventurous–HOW DARE THEY. I think I’d never leave it’s side if you brought this to a potluck I was at! Love everything about it! I can see why it was easily devoured. Love non-mayonnisey salads like this. I’ll definitely try it! SO making this! And YES to NO olives 🙂 Sorry sweetums, gotta agree with The.Boy on that one! I love this idea, it would be a nice change To not have to explain everything in what I make and still be able to serve it and not feel like I’m sacrificing flavor, plus my 18 month old loves anything with feta! Do you think a spinach chiffonade would be good in it? WONDERFUL! Made this last night for myself with the intention to have it for lunch as well. Just as good the next day. I did add some sliced olives and an extra tsp (or 2) of sugar to the dressing since I like it sweeter. I saw another recipe similar to this and there was NO sugar and it was awful…unless you prefer the non sweet taste, I just couldn’t do it. 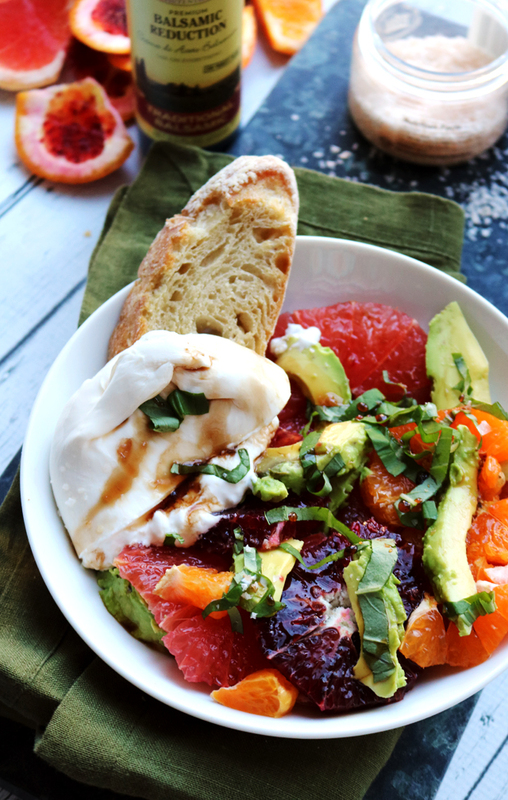 But over all a great salad for summer! Thanks for sharing this recipe. I made it this evening and it is super delicious. I didn’t have red wine vinegar so I used red wine mixed with a little balsamic and it turned out great. This just came across my Pinterest radar. Oh. My. Yumness! Is it bad that I want to add quartered slices of good Italian salami before I’ve even tried this recipe? Maybe I’ll do half with and half without. Maybe I’ll throw in the olives. 😉 It sounds amazing just as it is. Haha, I have to admit, I haven’t eaten salami in years, but I do think it would be great in this salad! 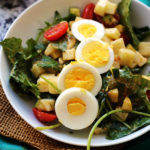 I love olives, but my husband hates them, which is why I didn’t put them in this salad…though I definitely encourage that you do! This was delicious!!!!!! We didn’t have left overs either. This just taught me to make a double recipe next time! I haven’t bought dressing in years, so unfortunately I can’t really recommend a brand, but if you have a favorite storebought Italian vinaigrette, then I’m guessing it will go pretty well in here! 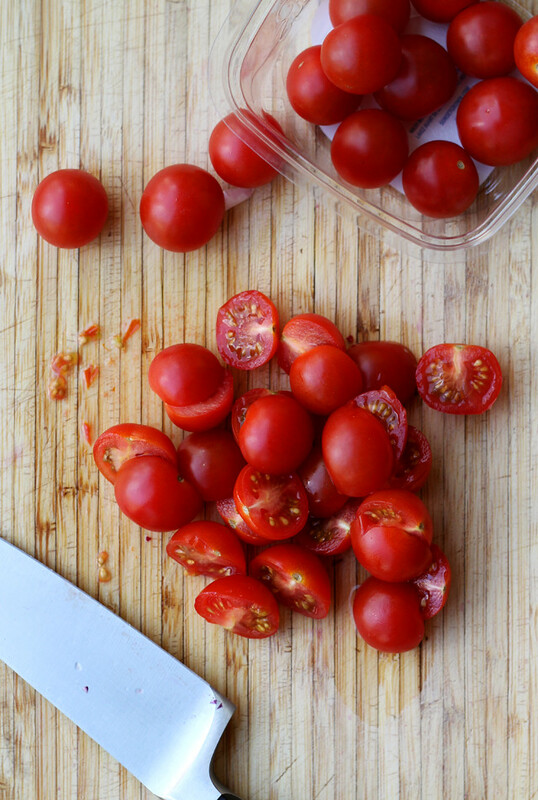 You could also make the dressing ahead of time (like tonight or tomorrow) and refrigerate until you’re ready to use it! It really comes together in only two or three minutes, but it’s up to you! We had this last night for dinner. The three of us wiped out the whole bowl and they were wanting more! Thanks for the wonderful recipe!!! Finally! Someone who shares my disdain for celery! I can’t even stand the smell of the stuff. I was searching for a tortellini salad and your’s looks perfect! I absolutely love this tortellini salad. I’m not a big pasta salad eater because I don’t like mayo that much. I made this special for a birthday party we are having tomorrow so people who don’t eat meat can eat something tasty. This was so good, I actually ate the pasta salad! Made this last nite. WONDERFUL!!!!! Everyone liked it cold tho. Will definately make again. Thanks for the recipe! Made this yesterday for a BBQ. Everyone loved it. I love acid so added a bit more red wine vinegar … it was awesome! Looks yummy! Going to make this for dinner Can this be eaten cold too? Or is it better warm/room temp? I like it best warm or at room temp, but that’s more of a warm food preference on my part. It is good cold too! I made this for dinner tonight and it was AWESOME!!! Fresh and light but still filling enough to stand on its own as a meal. I like a little kick so I added a tad more red pepper flakes. I just love this recipe and have subscribed to the mailing list for more great recipes. So glad I tried this!